That was a rhetorical question. Click through the comic book below to see how the incredibly talented illustrator, Conor Nolan, brought John and his twin, Chief Assist Officer Don Stockton, to life. 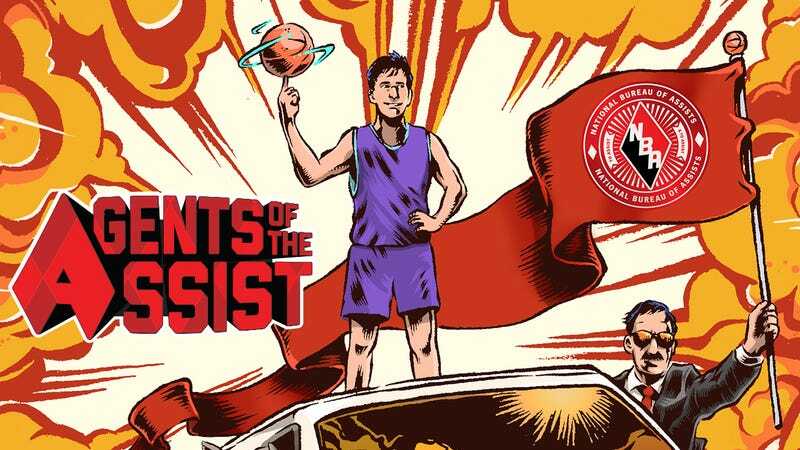 Thinking of John Stockton as a heroic force for good isn’t a stretch. In his heyday, Stockton embodied the value of substance over style. He may not have a showy highlight reel, but for nineteen seasons, Stockton fueled a deadly offense with his assisting abilities. John’s twin brother and State Farm assist legend, Don Stockton, has become the own gold standard in his own assist arena: insurance. Together, the two brothers have etched their names in the record books as heroes determined to help others. Reaching the esteemed heights of the Stockton twins takes experience and commitment. Today’s State Farm agents are always working to live up to John and Don’s level of assist expertise. Head here to learn more about how your local State Farm agent can assist you. Conor Nolan is a Brooklyn-based illustrator. His work has appeared in Vice Magazine, Dark Horse Comics, The Sword, and Irregular Magazine. Some of his recent gallery shows also include Spoke Art’s Wes Anderson “Bad Dads” annual in 2013 and Ltd. Art Gallery’s Winter is Coming, Game of Thrones themed show in 2014. Craig Lowell is a Brooklyn-based writer. His work has appeared in Sports Illustrated, Deadspin, NBA TV, TheFanHub, TheSportsPost, and the North Adams Transcript. The NBA and individual NBA member team identifications are trademarks and copyrighted designs and/or other forms of intellectual property that are the exclusive property of NBA Properties, Inc. and the respective NBA member teams and may not be used, in whole or in part, without the prior written consent of NBA Properties, Inc. © 2015 NBA Properties, Inc. All Rights Reserved.